Vaseline Intensive Care Cocoa Glow Body Lotion Review Reviewed by Nikki Mishra on February 2, 2018 . This product comes with all the goodness of cocoa butter and shea butter. The body lotion leaves charming and moisturized texture for your skin. Winter is knocking the door and I have already bagged some moisturizing lotion. Probably the worst thing about winter season is skin dryness and lip dryness. Apart from all these things, I absolutely love everything about winter. 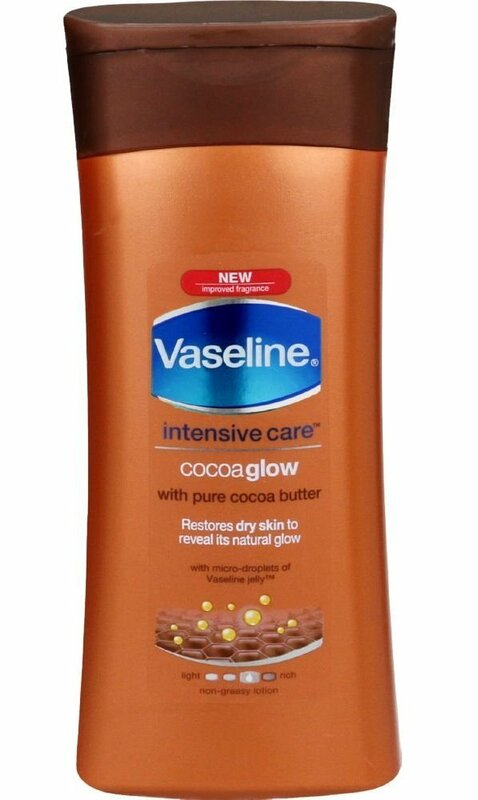 Today, I shall review on Vaseline Intensive Care Cocoa Glow Body Lotion. As the name of product suggests, it will moisturize skin and at the same time it will add intensive glow on the skin. So, are you thinking about purchasing this product? Read my review first and then make a decision. This product comes with all the goodness of cocoa butter and shea butter. The body lotion leaves charming and moisturized texture for your skin. Your skin will retain glowing effect even during extreme dry weather conditions. The rich formula of this skin cream gives excellent skin nourishment. Applying this body cream or moisturizing lotion is simple. I generally use it after having shower and before going to sleep at night. You can apply it anytime as per your convenience. Take small amount of the lotion and apply on the skin with gentle rubbing. I shall start my opinion right from product packaging. The packaging is simple yet convenient. The plastic bottle is sturdy, and it is equipped with a flip cap. Turn flip cap on the upper direction to open. Now, take small amount of the cream on your hand. As you start pouring the cream from bottle to your palm, you shall notice the thick creamy texture of this lotion. It has creamy rose color and a nice mild fragrance. Apply it on your body and rub gentle. It gets absorbed on the skin readily and it does not feel greasy. The moisturizing effect stays for me at least 5-6 hours. It is to be noted that I tend to get very dry skin during winter. If you have lesser dry skin, you may observe that the moisturizing effect will stay longer for you. One more things I would like to add that this lotion works well on stretch marks. I have tried this lotion over my thigh stretch marks and I have noticed that skin is getting even and stretch mark has faded out a little. Small quantity of Vaseline Intensive Care Cocoa Glow Body Lotion will help in excellent skin moistening. At conclusion note, I would definitely say that Vaseline Intensive Care Cocoa Glow Body Lotion is a good skin moistening product for winter season. It is extremely good for dry or normal skin type. Goodness of shea butter and cocoa butter adds natural sheen or gloss on skin. Indian Makeup And Beauty Blog Providing Makeup And Beauty product Reviews, Fashion Trends, Women Issues, Health and Fitness, Makeup And Beauty Tips Online Bollywood Trends, Indian Makeup Blog Online. Copyright © 2015 MakeupAndBeauty.in All Rights Reserved.